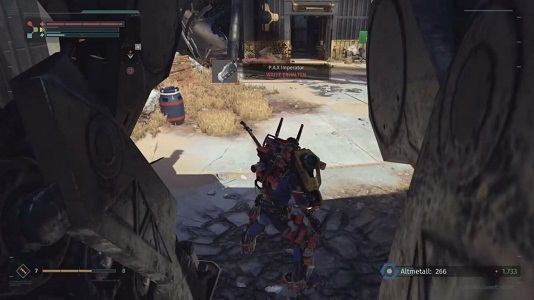 Pacification Automation X (P. A. X) is the first boss you'll encounter in The Surge. He can move faster than you think, and you don’t have to have explored the entire level to find him. You'll find him in the area of rocket production station, but he appears only after you have fulfilled certain conditions. If this is achieved, he will raise his systems and surprise you at his location and directly involved in a fight, even if you have been there a couple of times. On your way to PAX, you are threatening a lot of toxic gas in the main manufacturing line. You reach this by turning right from the service station. Then at the dead you have climb the stairs up and there you find stairs again, which lead you down again. But beware that you will be attacked by an enemy. Now go to the rubble heap and you will find the access to the rocket production station. - Stay Behind PAX: Try to stay behind the boss to attack his legs. The Mech is very big and his electric blades and kicks will quickly defeat you, so stay behind and focus on his lower body. - Dodge: The strokes of PAX Are very hard, so you should rather avoid than block. - Short Attacks: Don't be tempted by too many attacks. You should add a few hard punches to the boss and then retreat. - Special Attack: If you missed the boss some hits, he will rise in the air and shoot with missiles. At this moment try to get under him, as the missiles may hit him. When you meet him, if the orange colored groin is filled, then he starts his special attack. - Vulnerabilities: Go to the ground now and then, you have to attack one of the three vulnerabilities. You'll find one on his back and two on the front. If your attacks are hit PAX, in a state of distraction. Now you can leave the area, as a lift is released by leaving. The Mech. drops three rewards that you can use to make new deeds. The rewards are: 2.000 scrap metal, one handed boss weapon and vital boost v.3 implantat.